If you’re lucky enough to live in an apartment or house with a garbage disposal, you will be fully aware of how just how handy these devices can be. Take unwanted leftovers from mealtimes and toss them into your unit to be ground up and whisked away – it couldn’t be any simpler, right? With Thanksgiving and the Holidays coming, you’re likely to be tempted to shower your garbage disposal with affection for all the labor and time it is set save you as you clean up after the feasts you will be serving your guests. In order to avoid creating a long-term plumbing problem, however, you’ll need to ensure that you treat your appliance with an appropriate level care and respect. That means keeping your device clean and operational, and only dropping suitable waste into it. This guide will talk you through the essential do’s and don’ts associated with a traditional American garbage disposal. Follow this advice, and you can use your appliance sage in the knowledge that you are not risking clogged pipes, damaged blades, and the need for professional assistance in making your garbage disposal operational again. There are certain steps that you need to take in order to keep your garbage disposal operating at maximum capacity. Conventional wisdom suggests that electrical appliances are best used sparingly so as not to be worn out, but this is not the case with your garbage disposal. Even if you have no intention of using the device, turn it on at least every few days and let the blades spin, running a little cold water over them for around thirty seconds. This will prevent your garbage disposal from seizing up (think of it as a warm-up for the main usage that will follow in time), and will prevent the blades from experiencing any rust or corrosion. What’s more, regular running of your appliance will ensure that any food remnants that may be lingering out of sight will be flushed away and avoid solidifying and causing an unwelcome blockage. Cleaning your garbage disposal is essential. It will not only prevent any unwelcome foul smells from filling your kitchen, but it will also sharpen the chopping blades and ensure that you enjoy a long and beneficial relationship with your appliance. Bleach is certainly effective, but you’ll want to avoid constantly pouring harsh chemicals into your garbage disposal. Instead, simply use cold water, run at regular intervals, and toss in some ice cubes. Couple these with salt and baking soda and you have the makings of a very potent DIY method of cleaning the blades and pipes of your tool, or freeze a little vinegar within the ice cubes. This will sharpen the blades of your garbage disposal too – or you could also include some eggshells for the same purpose, provided they have not been hard-boiled. 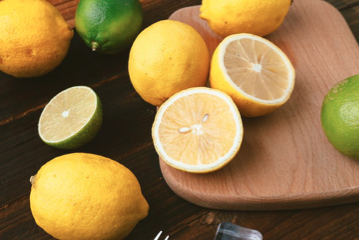 Another hugely effective way of cleaning your garbage disposal is to chop up a citrus fruit, such as lemon, and feed this through. Make sure that you include the peel, as this contains the most acid, and you’ll find that your appliance retains optimum performance as well as smelling great. To finish up the cleaning process, take an old toothbrush and clean around the rim. Use a little soap if necessary, or work with the domestic products that we have just discussed – vinegar, salt and baking soda are all very powerful weapons in the battle against a dirty garbage disposal. It sounds obvious, but so many of us fall into the trap of expecting too much of our garbage disposal. Don’t just pour an entire plate of waste into the sink and switch on the device, expecting it to do all of the work for you – the blades are only so large and powerful, after all. Instead, sift through what you’re planning on using your garbage disposal for, and use a kitchen knife to chop these leftovers into the smallest possible pieces. Have you ever tried to cram too many sheets of paper into a shredder at once, and found that they jam the blades of the device? The same will happen if you attempt to squeeze too much food into your garbage disposal – with the main differences being that paper will not begin to smell terrible after a day or two, and attempting to yank a rogue carrot from a garbage disposal is more likely to cost you a finger than wrestling paper from a shredder. Don’t take any chances. Spend an extra minute or two getting your food waste as small as possible for a fast and efficient service from your appliance. Once you have finished chopping your leftovers, don’t switch off the disposal immediately afterward – leave the water running for an extra fifteen to twenty seconds once you’ve finished. This will help flush away any stubborn food remnants that are clinging to the pipes of your garbage disposal system, just out of your sight. For every positive step, however, there is an equally essential negative action that must be avoided at all costs. If you find yourself acting against these instructions, you could find yourself in all kinds of trouble with the maintenance of your garbage disposal. 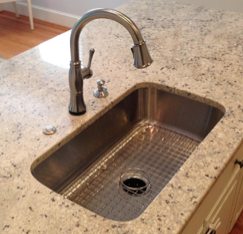 You may be used to washing up with warm or hot water, but cold water is the way to go with a garbage disposal. Hot water will melt down and soften up food remnants, which will help this waste cling to – and clog up – the pipes of your disposal system. When you have a sink filled with dishes following dinner, it’s easy for things to get mixed up and non-food items can land in the garbage disposal. This is potentially damaging if it’s a piece of silverware such as a fork or spoon, which will potentially blunt the blades as the continually clash with the utensil, or it could be increasingly dangerous if a glass or porcelain mug or cup ends up in there. Obviously you should also avoid grinding any non-food related item such as paper! If you are concerned about the possibility of non-food related items ending up in your garbage disposal, consider leaving it switched off until you have cleared the kitchen sink. We get it, bones are icky and you have plenty left over once you have carved a huge turkey or chicken to feed your hungry family. Don’t be tempted to throw the carcass of your main course into the garbage disposal, though; they will lead to the blades of your appliance becoming dull, and potentially slide straight down the pipe and cause a blockage. Throw such remnants straight into the trashcan, along with tough pits or seeds from fruits. Your garbage disposal is tough but it’s not invincible, and it won’t be able to slice through anything too small to be captured. No Fibrous or Starchy Foods! Foods such as pasta or rice will expand once they get wet, so anything that is not sliced and diced by the garbage disposal will later end up blocking pipes. High fiber foods, such as lettuce, the skins of onions or potato peelings, are also to be avoided. These items can wrap around the blades of your garbage disposal, slowing it down in its work and eventually jamming the blades entirely. Picking them out by hand can be a dangerous business, so don’t put yourself in such a position where that becomes necessary. Nobody enjoys disposing of hot oils and fats, and the idea of just tossing them into a traditional trash bag is hideous to many. For a start, there’s the smell to deal with, as well as the risk of younger family members burning tiny fingers on the liquid, or family pets being attracted by the strong scent and tearing the bag open. All the same, throwing oil or fat down the drain is a surefire way of clogging up your garbage disposal. These liquids will solidify and congeal further down the pipes, and it’s likely that no amount of cleaning will deal with that. Wipe down the contents of your pots and pans with some kitchen towel before giving them a good hand wash, or invest in some airtight disposable Tupperware and throw away your grease and fat wastes this way. It’s the safest method in the longer term. If you follow these steps, you should enjoy a long and fruitful relationship with your garbage disposal – and will understand just how useful these tools can be. Treat yours with the appropriate respect, and it will save you all kinds of effort and expense in the longer term.